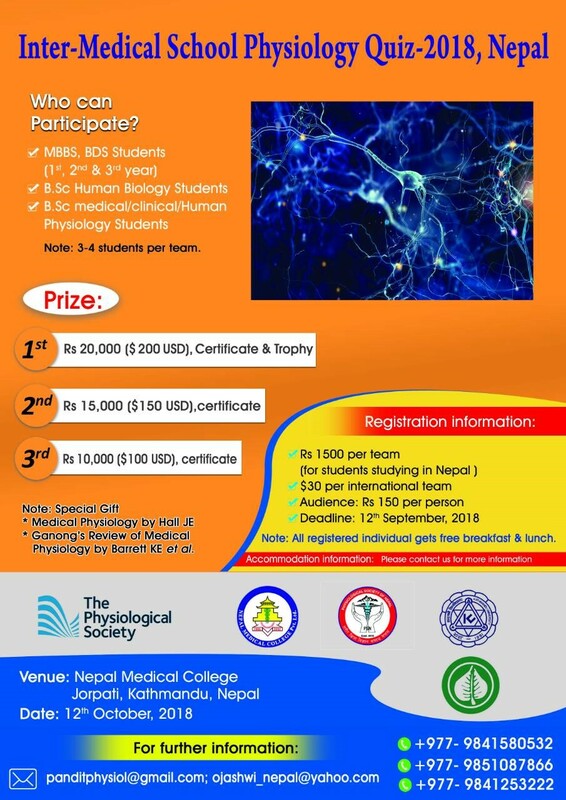 "Inter Medical School Physiology Quiz-2018, Nepal" is going to be held on 12th October, 2018. The quiz will be taking place at Nepal Medical College, Kathmandu coinciding the 'Physiology Friday, 2018' declared by The Physioloogical Society (UK). The event is going to be hosted by Department of Physiology, Nepal Medical College in assistance from The Physiological Society (UK) and Kathmandu University School of Medical Sciences which will coordinate by the Physiological Society of Nepal. If total numbers of teams are beyond twenty, the top 20 will be selected in preliminary round for semifinal. The semifinal will be held in groups of five teams. The top four teams from semifinal will compete in the final for the prizes. Regarding the Accommodation, we will act as facilitator between quiz team and selected hotel. The teams are liable to pay the accommodation and other associated cost. However, the local transportation will be provided from the hotel to venue during quiz day. Please book your seat prior to formal registration. If team failed to register by deadline the preference goes to the other teams who are in waiting list.